Let Packer's arts faculty inspire you and your students! 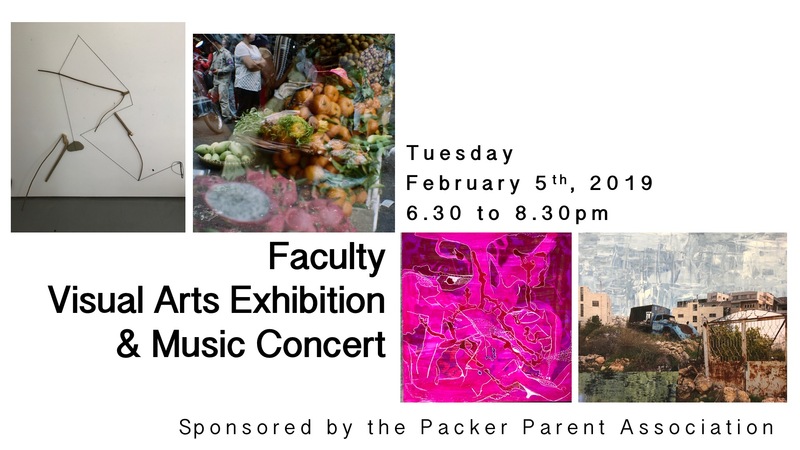 Next Tuesday, the PA will host its annual arts night celebrating our talented arts faculty. The evening features musical performances in the Chapel, followed by a visual arts reception in the Carol Shen Gallery. Come enjoy works by our very own professional artists. The event is free and open to students of all ages. Please join us for Cultural Enrichment Day. Experience Carnival through the lens of the Caribbean. Join us for an interactive journey through music, games, dance, and cuisine! Admission to this event is free. Lunch is $5 and we will be selling raffle tickets for wonderful prizes: $100 gift certificate to Books are Magic on Smith Street; Two sets of two seats to May Day Celebration; Dinner for two at Mayfield Restaurant; and 4 tickets to the Yankees at Yankee Stadium. We need lots of helping hands to create this wonderful celebration so please consider volunteering for Cultural Day. 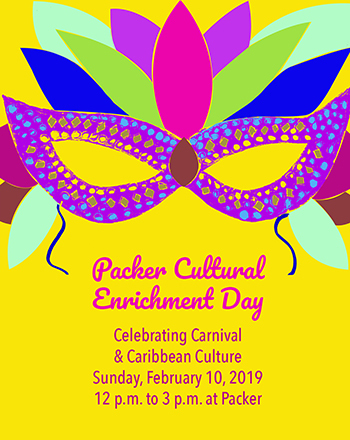 You can volunteer and purchase lunch bracelets and raffle tickets on line at packer.edu/culturalday or in the front hall of Big Packer from 8 to 9 am Monday, Feb 4 through Friday, Feb 8 or in the front hall of Little Packer from 8:30 to 9:30 am on Tuesday, Feb 5 and Thursday, Feb 7. All ages are invited! In the spirit of our MLK Day "Immigration Peace Workshop and March," we are supporting a drive to help children separated from their families seeking asylum, some of whom are currently in the Cayuga Center in Harlem, NY. The Cayuga Center would greatly appreciate donations of art supplies and Spanish books for children of all ages. There will be a bright orange and yellow donation box at the front desk in both the main building and the Packer Early Learning Center. The drive will end at the end of the day on Friday, March 1. Please join the Community Service committee at an event open to kids of all ages (Preschool and Lower School participants should be accompanied by an adult). We will be sorting, organizing, and preparing donations of baby clothing, toys, and books for the families in their program. Room to Grow has a vision that one day all parents will have the resources they need to unlock their families' potential and become champions for babies and their community. It offers structured coaching, material goods, and community connections to support parents as they activate their natural strengths and expand their knowledge, so children thrive from the start. Please RSVP by noon on Wednesday, February 27 to communitysvccochair@ packerpa.org. 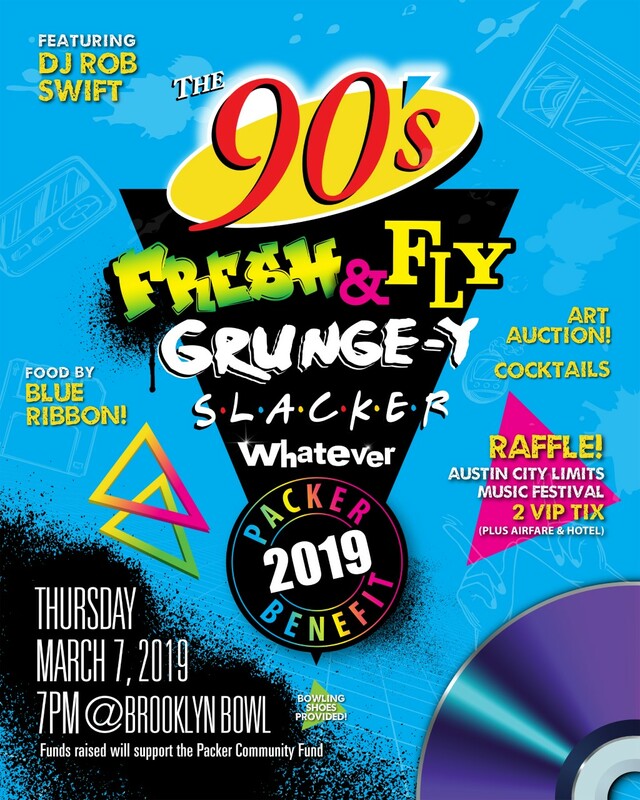 Travel back in time to the 1990s to celebrate and support the Packer community! Let's get together at Brooklyn Bowl for an evening of delicious food, drinks, bowling, and dancing to your favorite way back playbacks. And that's not all! Bid on art work donated by acclaimed Packer community artists and participate in the text-to-give to support the Parents Association and the PA Community Fund. Underwrite or buy your tickets now because it's gonna be all that and a bag of chips!